Journal, and we are now listed in their Professional Editing Help pdf list. For all Neurology® authors, Falcon Scientific Editing will provide FREE abstract editing with a full editing order and a 15% discount off all of our services (editing, translation, illustration, formatting)! 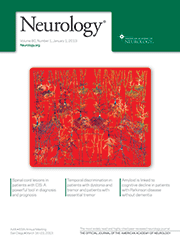 "Neurology® is published weekly and its circulation exceeds 21,500. It is the most widely read and highly cited peer-reviewed neurology journal with an impact factor of 8.286 (2014)." Their mission is "to provide neurologists with outstanding peer-reviewed articles, editorials, and reviews to enhance patient care, education, clinical research, and professionalism," and their vision is "to be the premier peer-reviewed journal for clinical neurologists." We at Falcon Scientific Editing are looking forward to helping Neurology® authors who seek assistance in editing, translating, or formatting their manuscripts. Please note that "Neurology® does not endorse any writing/editing services."